NEVER FIGHT ALONE - Master two-man combat with a live or AI partner to form the deadliest private military partnership a government can buy. BREAKTHROUGH PARTNER AI - Fight alongside an AI partner who adapts and works with you like a live player. UNIQUE CO-OP TACTICS - Sniping, riot shield, vehicles designed for two-man operations, and more. GO AGGRO OR DIE - Team up with your partner to blast out of trouble and take down enemies with the all-new Aggro feature. 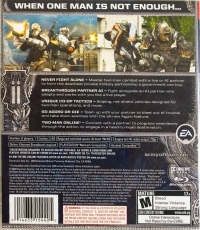 TWO-MAN ONLINE - Connect with a partner to progress seamlessly through the action, or engage in a head-to-head deathmatch. 05-18-2017 silverbow Box Text WHEN ONE MAN IS NOT ENOUGH… NEVER FIGHT ALONE - Master two-man combat with a live or AI partner to form the deadliest private military partnership a government can buy. BREAKTHROUGH PARTNER AI - Fight alongside an AI partner who adapts and works with you like a live player. UNIQUE CO-OP TACTICS - Sniping, riot shield, vehicles designed for two-man operations, and more. GO AGGRO OR DIE - Team up with your partner to blast out of trouble and take down enemies with the all-new Aggro feature. TWO-MAN ONLINE - Connect with a partner to progress seamlessly through the action, or engage in a head-to-head deathmatch. 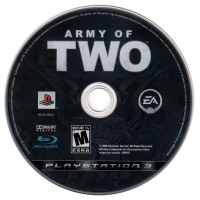 This is a list of VGCollect users who have Army of Two in their Collection. This is a list of VGCollect users who have Army of Two in their Sell List. 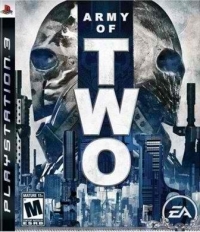 This is a list of VGCollect users who have Army of Two in their Wish List.